The last thing you want to hear when you're home alone is the sound of someone else banging around in another room, so when a woman in Oregon heard what sounded like a burglar hiding out in her house in the middle of the day, she called the cops. Though, even after officers arrived and entered the home with guns drawn, they couldn't convince the suspect to reveal themselves, which isn't all that shocking... considering the would-be culprit turned out to be a Roomba trapped in the bathroom. After receiving a call on Tuesday from a woman in Washington County, Oregon who was convinced a stranger had locked themselves in her bathroom, multiple deputies responded in full force and surrounded the home. The woman claimed she could see moving shadows under the door, and the authorities demanded the "suspect" come out via loudspeaker. Still, that didn't work, so they carefully entered the house with guns drawn, and even called for K-9 backup. That's when they decided to bust through the locked door, only to discover the presumed burglar was actually just a trapped Roomba bumbling around on the floor. “As we entered the home we could hear rustling in the bathroom. We made several announcements and the 'rustling' became more frequent. 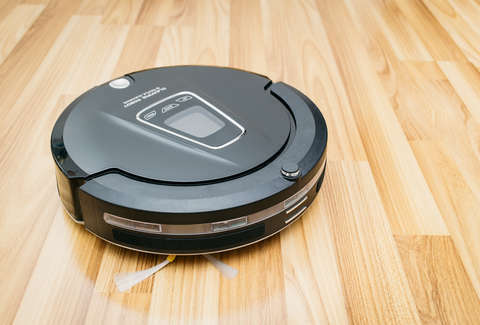 We breached the bathroom door and encountered a very thorough vacuuming job being done by a Roomba Robotic Vacuum cleaner,” the Washington County Sheriff’s Deputy Rogers wrote in his incident report, according to a Facebook post. While it's always better to be safe than sorry, the Sheriff's office had a good laugh over the ridiculous turn of events, posting a play-by-play of the whole incident on Facebook alongside a photoshopped "Most Wanted" poster of a Roomba stamped with "captured" in big red letters. And sure, this harmless robot "intruder" situation may seem like a silly scene today, but let's not fool ourselves. Robots are probably going to kill us all. UPDATE: The Washington County Sheriff's Office released 911 audio and body cam footage of the whole event, and, well, you really owe it to yourself to watch.